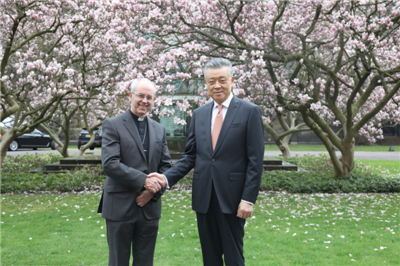 On March 8, Ambassador Liu Xiaoming met with the Most Revd and Rt Hon. 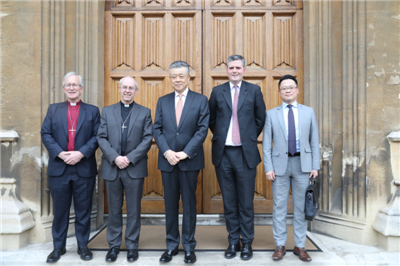 Justin Welby, the symbolic Head of the worldwide Anglican Communion and Archbishop of Canterbury at Lambeth Palace and exchanged views with him on China-UK relations and the friendly exchanges between religious groups of the two countries. The Rt Revd David Urquhart KCMG, Bishop of Birmingham and the Archbishop of Canterbury's envoy to China was present. Welby said that at present China has become the second largest economy, achieved remarkable economic and social progress, and gathered rich experience in religious affairs. He is delighted that China-UK relations are developing steadily and the people-to-people and cultural exchanges are getting increasingly closer. The Anglican Communion attaches great importance to the friendly, traditional relations with CCC/TSPM. In 1978, the Archbishop of Canterbury paid a visit to China for the first time. Since then, every successive Archbishop of Canterbury visited China once during their tenure. Welby mentioned his first visit to China in 2015 and his in-depth exchanges with China’s leaders and religious personages. He looked forward to another visit to China to further promote friendly exchanges between the worldwide Anglican Communion and CCC/TSPM, and to learn from China’s successful experience in developing religious undertakings independently. Ambassador Liu said that in 2015, President Xi Jinping paid a successful state visit to the UK and initiated China-UK “Golden Era” with the British leader. China is willing to work closely with the UK and meet each other half way to make China-UK “Golden Era” strong and enduring. China’s policy of freedom of religious belief is based on the country’s national and religious conditions, and it will keep to this orientation in protecting its citizens’ right to religious freedom and maintaining religious and social harmony in China. China stands ready to conduct exchanges and mutual learning with religious groups around the world on the basis of equality and mutual respect. He welcomed Archbishop Welby to China at a convenient time to further promote the friendly exchanges between CCC/TSPM and the worldwide Anglican Communion.